HIV is taboo, no one wants to talk about it much less acknowledge its existence. Most of us move through our sexual lives without a thought of it, even though it’s death lurking at the door step. HIV is the real life Freddy Krueger. But like all ailments that the pharmaceutical industry proclaims as incurable, there’s light at the end of this tunnel, and this light is called Ground Black Seeds(Nigella Sativa) . 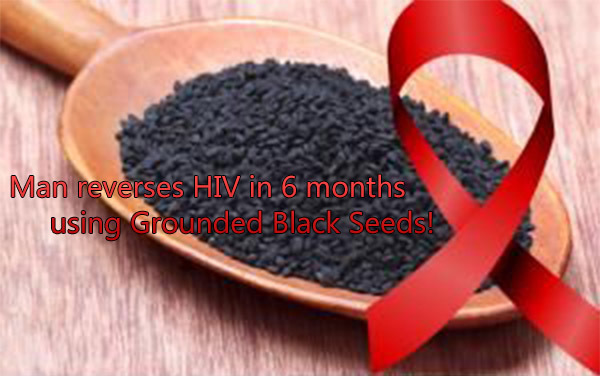 I found this incredible article on the US National Library of Medicine PubMed, which states that ground black seed reversed a HIV+ man to HIV- negative within 6 months. Below is an excerpt of the article. YB (25/Os), a 46 year old man, was an artisan (panel beater) who was recruited via the herbalist into the prospective (doctoral) research study and presented with fever, diarrhoea, weight loss and malaise of 3 months duration. He had multiple popular pruritic skin lesions and weight loss evidenced by prominent zygomatic process with sero-positivity to HIV tests (ELISA and confirmed by Western blot). The pre-treatment CD4 count and viral (HIV-RNA) load were 250cells/mm3 and 27, 000 copies/ml respectively. Herbal therapist commenced treatment by dispensing 10mls three times daily of Nigella sativa concoction for 4 months effective from August 2009. He was monitored daily and visited regularly to ascertain the effectiveness of the herbal concoction. However, because of the patient’s occupation schedule (worked 7am – 7pm daily), he could only take the medication twice daily, thus lasting for almost 6 months (January 2010). The fever, malaise and diarrhoea disappeared on the 5th and 7th day respectively. The multiple papular pruritic lesions disappeared on the 20th day. However, the 1st monthly CD4 count was reduced drastically (160 cells/ mm3) despite rapid clinical improvement and significant viral (HIV-RNA) load (1000 copies/ml). Surprisingly, the CD4 count increased gradually from the 2nd month and viral load became undetectable. The CD4 count and viral (HIV-RNA) repeated at the end of therapy were 650cells/ mm3 and undetectable (≤ 50copies/ml) respectively. HIV screening (EIA) and Western blot were repeated on 187th day on herbal concoction therapy and were both negative. The patient was followed up regularly with repeated HIV screening, confirmation (Western blot), CD4 count and viral (HIV-RNA), with all showing sero-negativity and undetectable viral load with normal CD4 count (≥750cells/ mm3). The patient was not on HAART before, during or after the Nigella sativa concoction therapy. ” Read this article here. This PubMed article is basically saying that the doctors gave this individual 10 mls (2 teaspoons) of ground black seed twice daily for 6 months. The doctors then tested the individual for 24 months after treatment and he remained remained HIV-. I’m a witness to the miracle of these seeds, as it has brought all kinds of positive developments to my personal health and also to people I know. I’ve seen with my own eyes Black seeds cure someone of cancer, but for the life of me I never thought this heaven sent manna could reverse the dreaded HIV infection.